Walking into the cellars at Lopez de Heredia was one of my most memorable experiences in the wine world. 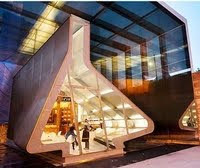 The glass tasting building has a cool decanter-shaped design by architect Zaha Hadid, so what's awaiting you underground is a shock. Black mold and cobwebs, everywhere. You feel like you've stepped back in time, maybe to the Spanish Inquisition. "Many wineries don't really use the cellar so they clean off the walls," says winemaker Mercedes Lopez de Heredia. "They don't want the mold. This is how a natural cellar really looks." "Of the year" awards tend to go to new kids on the block -- people making innovations that have changed the market or industry. But this year, tradition is the new black. Wine geeks aren't into pushing science forward anymore. 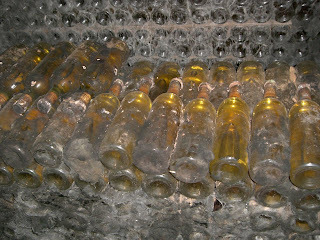 Everybody's excited about open-air fermentation, cement tanks, native yeasts -- the way wine was made by our grandparents. You could probably get more traditional than Lopez de Heredia. But this winery is so into age, it's freaky. The current release of their Vina Tondonia red wine, their flagship brand, is 1991. For the Vina Tondonia white, it's 1987. Even their bottom-of-the line Cubilla wine, a Crianza, has a 2001 current release. "We are famous for not accelerating the making of a wine," Lopez de Heredia says. And not just with wines -- they have some oak barrels that are 80 years old. Rather than buy new barrels, they prefer to replace individual broken staves on the old ones. For this, they have an onsite carpentry staff, which they keep busy by also making all their own doors. "It costs more to repair barrels than to make new ones," Lopez de Heredia says. ""But it is better for the wines. We want the micro oxygenation of the wine to be as slow as possible. For us, oak is a way for the wine to get better but it must not taste of wood." As for the cobwebs, she says, "The spiders are a natural way of taking care of fruit flies," which are a problem for the corks. This is an issue when you have whole racks of wines from 1890 sitting around in your cellar. 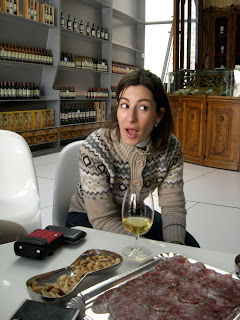 But Lopez de Heredia says wines that are too old are a gamble, so she refuses to sell anything bottled before 1942. Lopez de Heredia learned her excellent English as an exchange student in the US. She spent 12th grade in Kentucky. "My father sent the family wine for Christmas," she said. "They were Baptists, they don't drink. They gave it away to some Catholic friends. I was 18. I couldn't believe I didn't have wine with Christmas. I drank a beer and they almost sent me back to Spain." 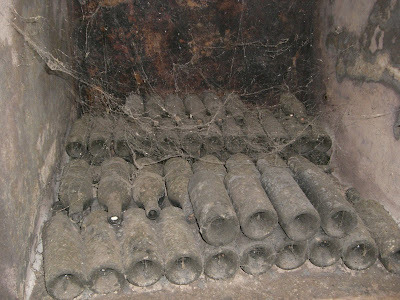 What I can't believe is that anyone would turn down the chance to try one of these wines, well-preserved by cobwebs and mold. I used flash to take a photo of one particularly ancient looking pile of bottles and noticed they were whites. Turned out they were from 1970, the year of Mercedes Lopez de Heredia's birth, and yes, they are for sale (if you ask). I asked to try one. To say she "dusted it off" doesn't really convey the amount of cleaning the bottle needed before it could be opened. But wow -- that was my most memorable wine of the year, from my most memorable winery visit of the year. What's greatest about Lopez de Heredia is that your granddaughter might be able to go there, to that exact pile of wines, and buy a bottle, and it might be even better. The color is golden yellow, and despite its age and lack of filtering the wine is clear. Initially it smells of ripe pear, honey, dried apple and wildflowers. The floral complexity increases as it warms. On the palate, there's still plenty of acidity. I could write a lengthy paragraph about the flavors using just nouns. Here are a few: pear, dried apple, flowers, walnut bread, minerality, macadamia nuts, cashews, peanuts. It gets more and more nutty with air. The mouthfeel is mead-like, honeyed but completely dry. It's sensual and still very fresh. An amazing experience. I refused to leave the winery until we finished the last drop; the wine deserved our complete respect. 100 points. This ran yesterday on Wine Review Online. This isn't about wine, but I have to get this off my chest. When are we, as a nation, going to stand up to terrorists? When are we going to stop diminishing our freedom and quality of life every time some lone crackpot tries something that doesn't work? At my fitness club this morning I was forced to watch CNN, where it's all terrorist, all the time. No wonder Americans are so fearful. But folks -- the attempt failed! The guy didn't cause a fire, didn't blow anything up, didn't cause a single injury to anyone but himself. Yet as a result, every one of the millions of air passengers in the US now can't go to the toilet for the last hour of every flight. That's going to make me miserable plenty of times, because I like to stay hydrated. And not only me. No, it is not a worthwhile sacrifice. This new restriction wouldn't have affected this terror attempt at all, because the guy was sitting in his chair when he did it. You know what would have helped? Having somebody realize that this guy's own father told the US Embassy several weeks ago that he was a security risk. US security officials let us down -- just like on 9/11, when they hadn't read their memos -- and now they're punishing all air travelers for their mistake. Moreover, Nate Silver published statistics at 538.com that show that, including the 9/11 attacks, you are 20 times more likely to be struck by lightning than to be on a plane where a terrorist incident occurs. We're not taking lightning strikes seriously enough! We need more lightning security! I want some leadership in this country. I want somebody -- preferably President Obama, but any major leader will do -- to stand up and say, "We will not sacrifice our comfort and our lifestyle to these lone terrorist actions. There may be more behind-the-scenes security procedures. Our screening on known potential terrorists may be stepped up. But we want to encourage American business people and tourists to continue enjoying the freedom to fly and travel that our ancestors and contemporary military continue to fight for." Who's with me, anyone? Or should we just concede that the terrorists have won another round? I've been away from the blog because I was on vacation in New Zealand and unable to reach a computer. My most memorable event wasn't our 5-day, 72 km hike or walking on a glacier or zipping through river rapids with only a boogie board. A week ago I drove from Queenstown to Dunedin after a morning spent canyoning (working through a river canyon by abseiling, ziplining, swimming, jumping, etc. ), which was a blast. We planned to see albatross and penguins in their natural habitat on the Otago peninsula. But we were hungry, and it was already evening. We went to a restaurant/bar on the Octagon, where I ordered venison tenderloin. Naturally, I wanted a local Central Otago Pinot Noir to go with it. My wife ordered crispy skin salmon, also a good Pinot dish. The bar had several interesting Pinots by the glass, and their bottle markup was too high, so we ended up having 3 glasses of Pinot, of which I drank about 2 1/2. While waiting for our food, I leafed through Lonely Planet and realized the best time to see blue penguins would be at dusk, still more than an hour away. I didn't want to rush my wife's meal, so while I ate hurriedly, I said nothing. But as soon as she finished, I said, "Let's go!" We raced to the rental car, jumped in and headed off. Less than five minutes later, I encountered a DUI checkpoint. 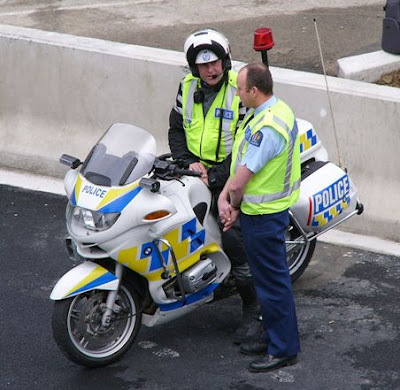 New Zealand police were pulling everyone over to be breathalyzed. My wife began beseeching God and Buddha for assistance while I considered a rapid U-turn. But several motorcycle cops there were probably just waiting for such an opportunity. So I decided to take my chances. I thought, what happens if you get a DUI in a foreign country? Can it affect your driving record at home? Will they keep me in jail until deporting me? Will I have to go back and face charges later? And what is the legal blood alcohol level here anyway? My wife just kept praying. Soon it was my turn, and the cop leaned into the window, explaining, "We're testing everyone for alcohol tonight. Please count slowly from 1 to 5 into the breathalyzer." I told myself, "Just act calm," but I could hear my heart in my ears. I tried to count distinctly without expelling much air, not easy to do when you're almost hyperventilating. The cop pulled the machine away. If there was a moment when I lost my carefully cultivated cool, this was it -- I leaned out to watch the display, which read, "Calculating … calculating …"
Could my wife drive the rental car back to the hotel? No, she's more of a lightweight than me. It would be towed, so we'd have that expense as well. Hopefully she could bail me out tonight. Would I need a lawyer? Our flight was in how many days, 4? Would I be able to leave? Wow. I almost cracked, "Hey, that thing's broken!" but fortunately I wasn't intoxicated or stupid enough to do so. The officer thanked me and we drove off, waiting to laugh for a polite 100 meters or so. 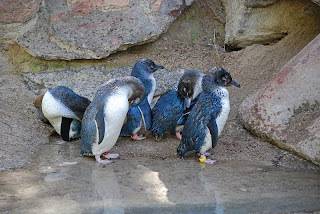 We did see blue penguins, no more than a couple of meters from us. But as exciting as that was, it will never be the highlight of that evening for me. Turns out the legal intoxication limit for New Zealand is 0.05. 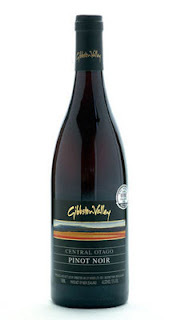 Central Otago Pinot Noir is not Burgundy -- most are about 14% alcohol. Using an Internet BAL calculator, that's exactly what I came up with for my estimated level. I don't think I was intoxicated; I wouldn't drive if I thought I was intoxicated. But there's no way that machine should have read NO AL COHOL. Thank you, God. And Buddha. Merry Christmas to all. I wish you as much good fortune as I had that night. I had an argument with a vegetarian friend on Facebook just before Thanksgiving that prompted me to think about how American politics has changed my personal food politics. After accusing me of being party to mass murder of turkeys, she complained that nothing she could say could stop me from enjoying a genetically modified, antibiotic-laden turkey on Thanksgiving. I don't care if animals bred for food are killed. Do vegans weep over the souls of farmed shrimp? But her parting shot -- an appeal to the environment and my health -- would have worked on me 6 years ago, and I might have spent the holiday wringing my hands with guilt. Not anymore, courtesy of George W. Bush. Though I'm a lifelong Democrat, I should send him a thank-you note. I have always been a political shopper. I believe your most important vote is the money you spend. The 2004 election changed me in an important way that I'm only now able to express. There are two types of social-values shopping: positive and negative. I can support businesses I approve of by buying their products. Conversely, I can reject products I don't approve of by refusing to buy them. Until November 2004, I practiced both. In fact, I gave up beef for 14 years because I am convinced that it's impossible to raise cattle for food in an environmentally sound way. I spent much of the 1990s evangelizing this position, annoying my friends every time they ordered a steak or burger in front of me, and trying my best to prevent anyone from getting a beef dish at any shared dinner. It wasn't easy to give up beef. I loved cheeseburgers, prime rib, kitfo (Ethiopian-style raw beef), beef tacos, steak tartare, short ribs. Note the two raw dishes: I liked the flavor of beef so much that I went through a phase of ordering my hamburgers raw, with onions, pickles and melted cheddar, after discovering it that way on a Tampa restaurant menu. I'm not an anti-beef activist anymore, and besides, "Fast Food Nation" evangelizes better than me. I still don't believe large cattle ranch operations can be run responsibly, and little operations can't really compete with the big guys. Bill Niman doesn't own Niman Ranch anymore; that should tell you something. So why did I eat at House of Prime Rib last night? About a week after Bush won re-election, I was out in one of the closest conservative suburbs to San Francisco. I noticed many people driving 9-passenger SUVs by themselves. I thought, I could live a Buddha-like life, never supporting any bad industries -- in fact, I could buy nothing at all, starving to death when my kitchen emptied -- but it would have no impact compared to what the mass market does. A steakhouse sells more beef in a day than I could forego in 20 years. I had my first cheeseburger in 14 years that very day. I had always identified myself as an environmentalist, but from 2005 to Nov. 2008 I was instead a jaded ex-environmentalist. I didn't litter or ask for extra styrofoam packaging, but I didn't deprive myself of anything I wanted. Why bother? Barack Obama's election forced me to rethink. In fact, that night, when I came in from literally dancing in the street, my wife asked if I planned to give up beef again. I said no, and it felt right, but I didn't have a solid reason. Now, thanks to my angry vegetarian friend, I finally have a cohesive philosophy. Even during my four years of being jaded, I never stopped buying organic or sustainable produce, fertile eggs from pasture-raised chickens, line-caught fish, all that sort of thing. I choose now to act only positively as a political buyer. I'm a locavore. I support people and businesses I believe in. But I don't bother to deprive myself of anything, because I don't see the point. I haven't bought a Coca Cola in probably 20 years. I haven't bought a Hershey's bar in maybe 30 years. Neither is for political reasons; they're just too sugary and simple for me. Nonetheless, is the lack of my patronage, for whatever reason, hurting their bottom line? Of course not. I can't stop the American beef industry from running roughshod over our public lands. But I can support a Marin County farmer who raises a small grass-fed herd sustainably. As often as possible, I will do that. And when I don't -- when I decide to have a hunk of prime rib, or a corporate food product (I am NOT giving up LVMH Champagnes) -- I'm not going to feel guilty, no matter what my further-left friends say. So that's my philosophy: Depriving oneself has no impact, but supporting good businesses has a positive impact. And yes Michelle, that mass-murdered, genetically modified, antibiotic-laden turkey was mighty good. Try it next year with some giblet gravy, made from the tasty internal organs. Mmm, mmm. 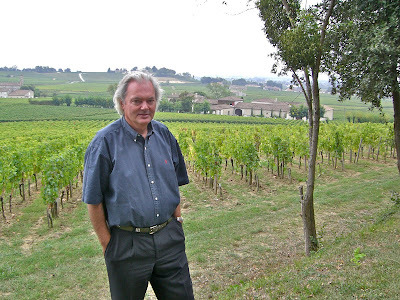 Louis Bouillot: Good value in Burgundy? Sacre bleu! For still wines, Burgundy is the most beguiling and frustrating region on earth. But for bubbly, it's a source of great values. Think about it -- they grow Pinot Noir and Chardonnay there. Why wouldn't they make good bubbly? I've been loving this wine on a regular basis ever since seeing it for under $20 on a Vietnamese restaurant's wine list. My dates with it feel like a clandestine affair, passionate and foamy and I guess I better stop there. What's not to love about an affordable pink bubbly made from quality Pinot Noir grapes? Even shipped halfway across the globe, it still undercuts domestic pink bubblies on price. Why pay $75 for pink Champagne when you can have this? The French village of Limoux claims to have been making sparkling wine longer than Champagne, but in modern times its wines have never been seen as reaching the same level of excellence. That's bad for Limoux grapegrowers, but good for consumers, because how often do you actually drink a top-level bubbly? And the best Cremants de Limoux are as good as or better than entry-level Champagnes at less than half the price. This wine is a great example. 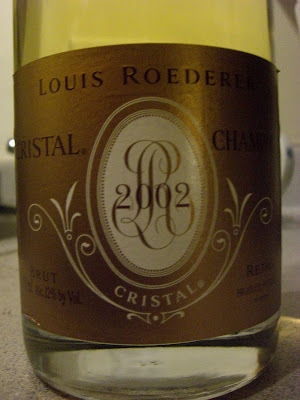 I'd rather drink this than many nonvintage Champagnes on the market, and I guarantee you won't find a Champagne for $13. 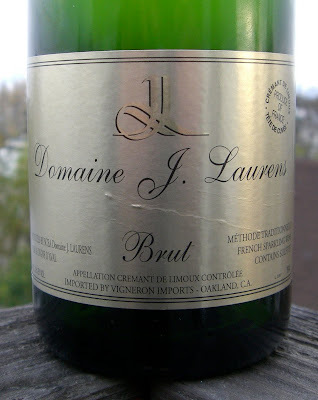 This is one of the best sparkling-wine values I've had this year. Want to feel like a first-class airline passenger, without spending $10,000? Most people don't realize that splits of sparkling wine are rarely made in the same way as full-sized 750 ml bottles. It's too much hassle to go through for wineries, so they usually use Charmat or another method of secondary fermentation, rather than in the bottle. 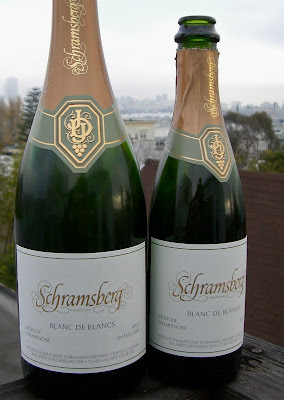 Schramsberg didn't do that with this wine; instead, they made it the traditional way, intending these splits for situations like first-class service on airplanes. You can drink first class with one of these cuties for the price of a super shuttle. People like to pitch half-bottles as perfect for one person, and it's true. But I want to point out that a couple can get two good-sized glasses out of this, and sometimes that's all you need. 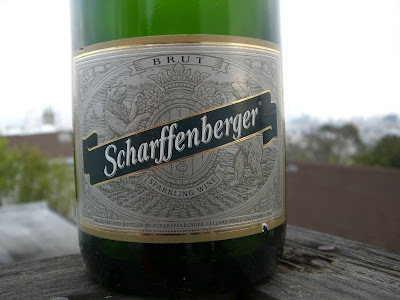 John Scharffenberger started his eponymous winery in 1981, when premium American bubbly was still a niche product. He sold it and moved on to making chocolate, but he sold that too. These days John raises Iberian pigs in Mendocino County to make high-quality ham. The distributors of Roederer wines have kept the Scharffenberger name in bubbles, though, and it's a product worthy of the man, even if he's not still involved. 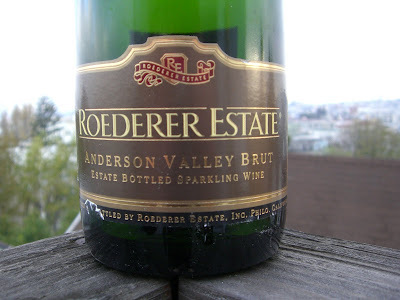 I like Roederer's wines both from France and their outpost in Anderson Valley. But they're very different. The French wines are subtle and elegant, while the California wines have brighter fruit. The bigger difference is price: Roederer's domestic wines are much cheaper in this country, not surprisingly. This wine is one of my favorite by-the-glass orders at restaurants all over the Bay Area; you never go wrong with it. It's bubbly of the day time! Americans don't drink enough sparkling wine. If I could have only one type of wine for the rest of my life, it would be bubbly. It goes with any food, it's refreshing and low in alcohol. And it's festive fun. 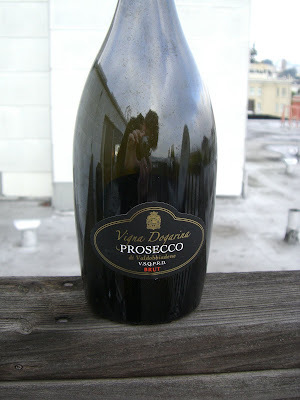 Here's the first, the best Prosecco I've had this year. It's brought to you by the folks at Paulaner, beer specialists who are dipping their toes in the wine market. So far, so good with this one. The bottle is stylishly black, so reflective that you can see yours truly snapping the photo. Everybody in the wine world felt something when Amazon.com announced in October that it was canceling its plan to sell wine. Wine lovers and small wineries gnashed their teeth while retailers, distributors and wine.com popped corks. At the time, everyone (including the Wall Street Journal) thought it was because of the maze of state regulations. I learned this week of an issue completely unrelated to wine that had far greater repercussions for the world's largest internet retailer: sales tax. Not just on wine, but on everything. Currently Amazon collects sales tax for only five states: Kansas, Kentucky, New York, North Dakota and Washington. It gets away with not collecting sales tax in the huge California market because it has no brick-and-mortar shop here. The problem is, once that California store was open, even if it was only 100 square feet with two items for sale, Amazon the company would have become a California retail shop for the purposes of state tax law, and would have had to start collecting sales tax on everything sold in the Golden State. One of the main reasons Amazon is so attractive to consumers is its low prices. Adding 8.25% to the price of everything in California would eliminate much of that. The company calculated that the profit it made from selling wine nationwide wouldn't offset the potential loss of business from California alone. Moreover, the sales tax issue would quickly have compounded. Once cash-strapped state legislatures in Florida and Texas and everywhere else realized California was collecting sales tax from Amazon, they would have reached for their share of the pie. It's easy to say Amazon could have sold only wines from Washington and New York -- where they're already collecting sales tax -- and Oregon, which has no sales tax. There are some great wines from those states, but how big is the market for them? Amazon doesn't like to lose, but in this case, it would never have been the go-to wine website, not when consumers could go to wine.com and buy brands they already know. Amazon's wine initiative is dead for now. But keep an eye on the California budget crisis, which is becoming like the never-ending TV show "24." (There's a bomb! A virus! A mole! How can we survive the hour!) There has been a lot of opposition to imposing sales tax on websites because the Internet industry is so important here. If that position ever changes, and Amazon has to start collecting sales taxes anyway, wine lovers might get an unexpected benefit.